Platform: Currently Available On PS4 and Steam...will release on Xbox One and Wii-U eventually. Story: Guy breaks in a ship for loot and then can't get out. What an absolutely great question, because I'm getting pissed off just thinking about this game. None of that is because the game is bad, mind you, it's exactly as advertised! Two Tribes told me this game will be an intensely difficult 360 shooter/platformer and they upheld that promise. This game is hard as hell! You know that saying "Out of the frying pan and into the fire"? That's this game in a nutshell. Things start out harmless enough in the first two levels, but quickly become non-stop shooting mayhem from beginning to end of each successive level. I'm sure there are a few shoot-em-up veterans here scoffing at me, but this isn't your typical float around and shoot stuff game. You'll spend more time on the ground jumping and dodging obstacles whilst simultaneously blasting enemies than you will floating and flying in a circle while you shoot. You'll die a lot, and the game will mock you for it. I kid you not at one point in this game I had to outrun fast flowing lava through an air-duct maze and simultaneously blast my way through blocked areas. As if that wasn't hard enough I fell directly from that into a boss sequence with little to no warning it was happening! It's so challenging it's impressive that the game can continually notch things up as you progress through. Along the way, you'll be able to upgrade your ship with special weapons that will save you in a pinch, as well as hack other robots on the massive ship to help you make your way through. You'll fight, you'll die, you'll learn and conquer. Eventually, if you get good enough you might be able to beat the game on "Single-Credit mode"...I don't see anyone doing that. Slowly but surely you'll make your way through what I can imagine will be one of the most underrated titles of 2016. Don't be the person that looks past this one based solely on looks. This is a top caliber game. 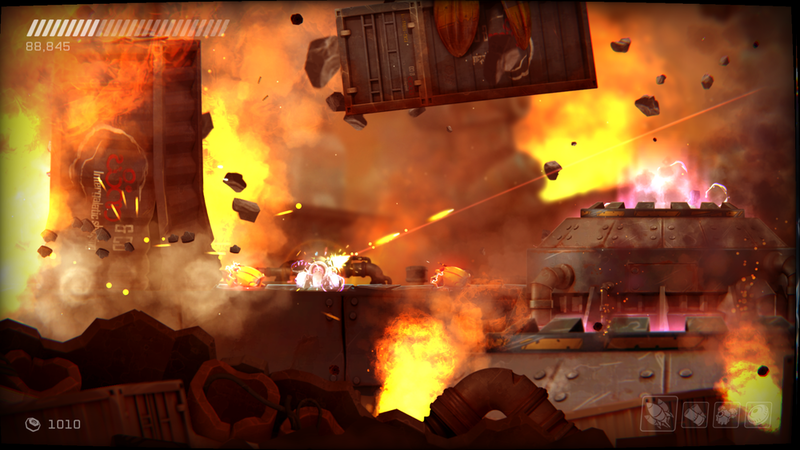 RIVE is a 360 shoot-em-up platformer that will make you angry with how hard it is. Even so, you'll get a lot of satisfaction as you claw and scrape your way through this well made game.